Esschert Design Butterfly Plant Caddy, Brown, 11.5" dia. Showcase beautiful butterfly shapes while supporting a potted plant with the Esschert Design Brown Butterfly Plant Caddy. This charming unit not only elevates your plant off of the ground; it also brings a unique, decorative element to your sunroom or garden. Three butterfly figures create the decorative top of this caddy, interspersed with flower, leaf, and tendril shapes. 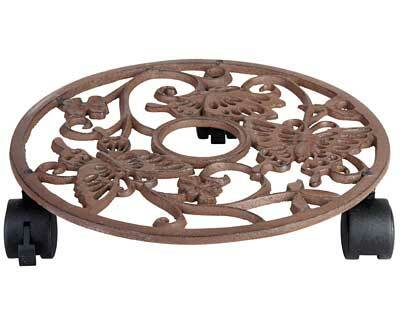 The brown color enhances the natural motif, while its cast iron construction remains durable. This caddy easily accommodates planters with an 11" diameter or smaller base, and three plastic casters make positioning and moving the unit simple. Two casters lock into place to keep the plant stationary, and the open pattern provides excellent air circulation around your flower's root system. Bring a bit of natural style to your potted plant with this Brown Butterfly Plant Caddy. Esschert Design Round Plant Caddy, Dark Brown, 11.25" dia. Esschert Design Round Plant Caddy, Aged Brown, 11.25" dia. Gardman Heavy-Duty Plant Caddy, Black, 10" dia.